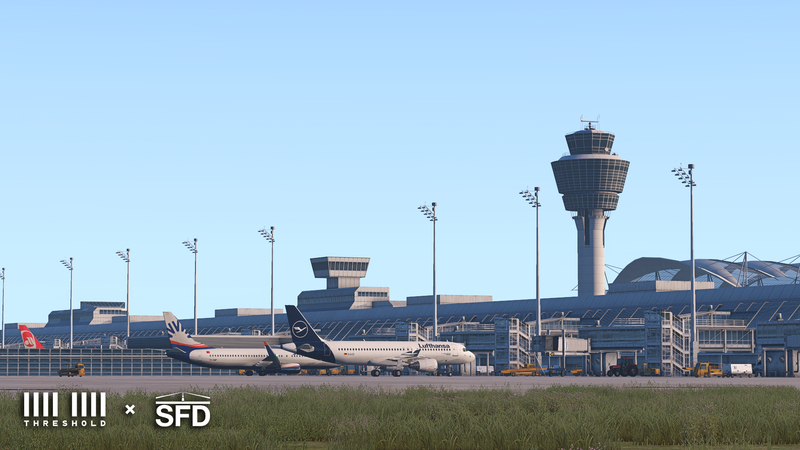 MisterX6’s freeware airports have long been the hallmark of X-Plane scenery development - his series of major US airports are some of the most downloaded in history and his recent move to payware scenery design has seen his standards only increase further. So, how does ShortFinal Design’s latest offering stack up? 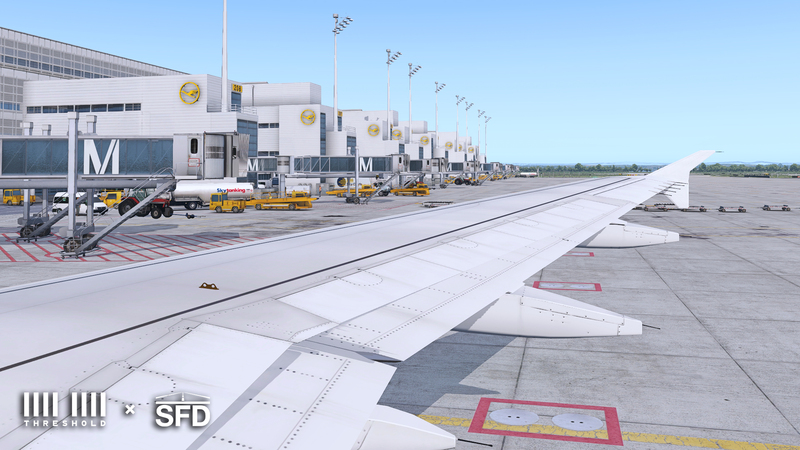 Justin, more widely known as MisterX6, kindly provided us with an exclusive pre-release copy of his latest project, Munich Airport (EDDM), to find out. Munich/Franz-Josef Strauss Airport (MUC/EDDM) is the second busiest airport in Germany, after Frankfurt-am-Main (FRA/EDDF). It serves Bavaria’s capital city, the third largest metro area in the country after Berlin and Hamburg. MUC was opened in 1992 and grew rapidly into Lufthansa’s second-biggest hub and now has 266 destinations across the globe. The airport handled 44.6 million passengers in 2017. The .zip file I was provided with totalled 848mb (subject to change - this review was conducted on a release candidate version) and once unpacked it tops out at just over 1.3 GB. The unzipped file displays two folders, the scenery itself and an Ortho4XP patch for the scenery. It also includes two copies of the manual, one in English and one is German. A few of the pages of the manual included with the scenery. Scenery installation is rather simple, just merge the “Custom Scenery” folder provided with the file of the same name in your root X-Plane folder. The aforementioned Ortho4XP patch is for those wishing to use their own orthophotos with the custom mesh included with the airport. Munich is a relatively light-weight scenery. An important point to note is that “Runways follow terrain contours” must be enabled, otherwise some features such as the taxiway bridges will not show correctly. Due wholly to my own negligence, this fact stumped me for about 10 minutes. The manual included is very detailed and answered most frequently asked questions; compatibility with Ortho4XP, how to correctly order the scenery_packs.ini file and how to avoid conflicts with the mesh, to name a few. It also outlines some of the options you have regarding static aircraft, animated features and a winter version of the airfield. To summarise, installation is very simple - just drag and drop. It only appears to get more complicated with the addition of your own ortho tiles, something I did not delve into in this review. The first order of business after downloading a new scenery is to have a poke around with the free camera, Munich being no exception. 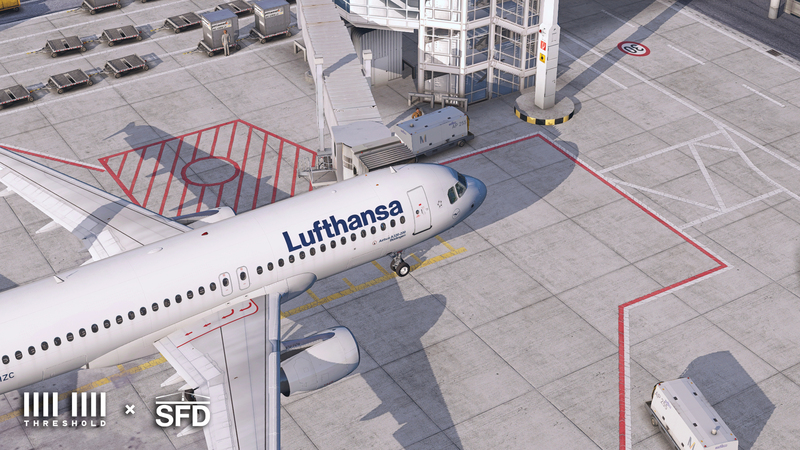 I loaded up in the FlightFactor A320 at one of the central gates, went to free camera mode and was immediately taken with the detail of the interior areas of the airport. 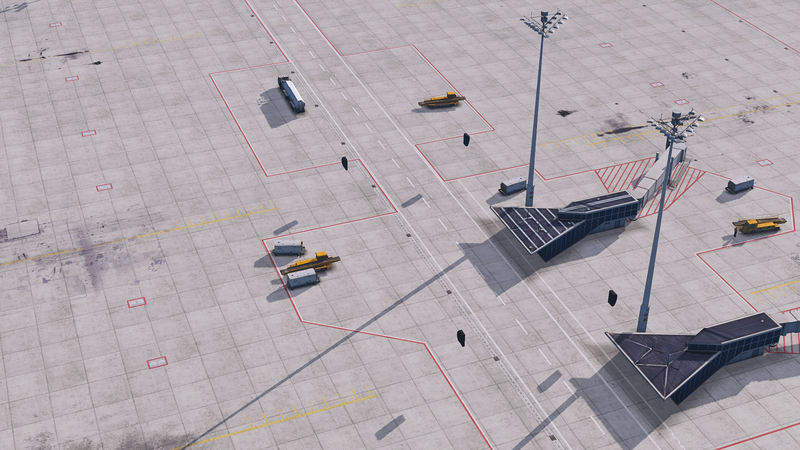 Many a scenery neglects the non-airside portions of the airport, however, at first glance, it appears the large outdoor areas between the two main terminals is modelled in much the same detail as the apron on which my aircraft sits. 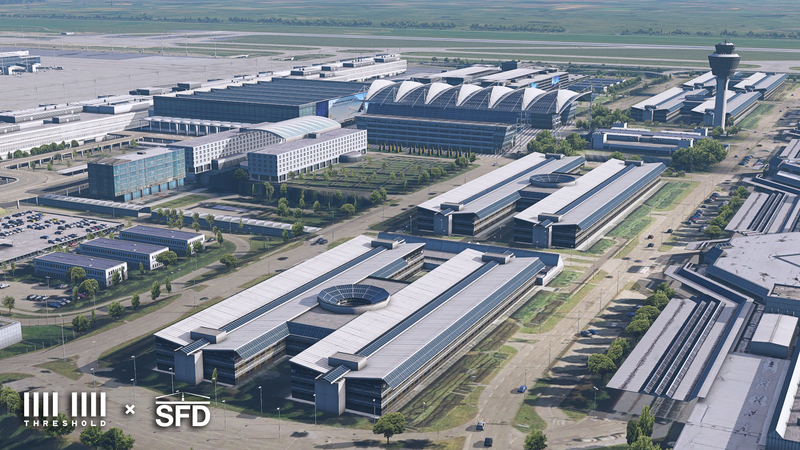 I’m very happy the developer decided to represent this part of the airport in such detail, as the non-airside portion of Munich makes up much more of the field as a whole compared to similar airports. Another thing that caught my eye was the road system - which gives the scenery the feeling of actually being ‘alive’ (as much as that is possible in a simulator), the scale of which I’ve never seen before. The entire road system in to and out of the airport is modelled, including the numerous raised interchanges and roundabouts flanking the main terminal buildings. I like the attention given to the roads and interchanges around Munich. In all, my first impressions were very positive. 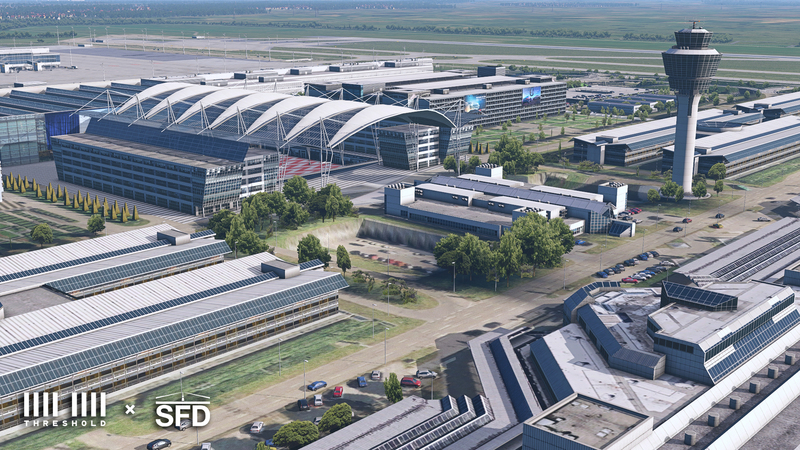 The buildings at Munich certainly live up to the standards of MisterX6’s previous work - intricate details are everywhere, from shade slats on the terminal building to individually modelled and textured support cables in some of the most far-flung areas of the airfield. The buildings are very well done and closely imitate the sharp edges of their real-life counterparts, with particular emphasis on the small details, such as the abundance of support cabling, which give a very realistic effect. Terminal interior modelling was fairly rudimentary, but that is all it needed to be, as it is only visible in certain instances and even then it’s hard to find any major immersion breakers. 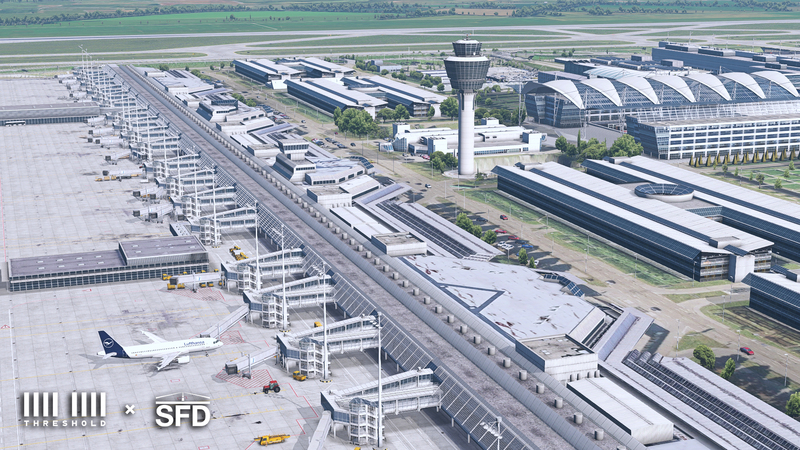 A comparison shot of the terminal modelling at Munich. While on the topic of buildings, I once again find myself gawping at the detailing present in the non-airside portions of the airport. 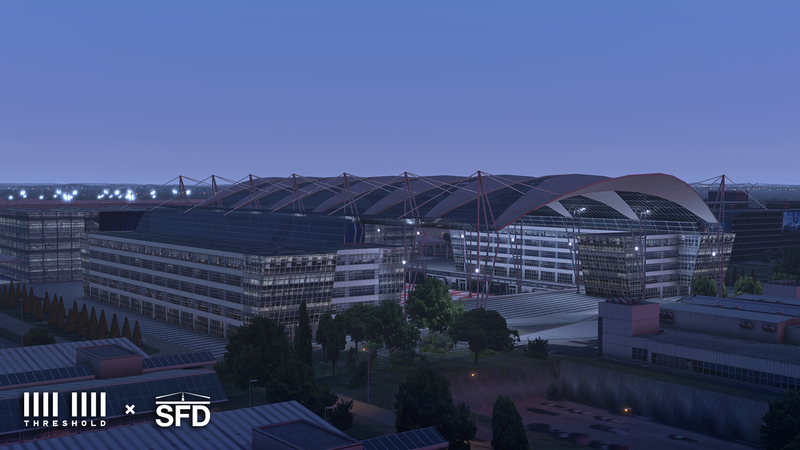 From afar, they look fantastic, with much of the roof detailing being at the level of the main terminal buildings, however, up close, you can see how the developer fleshed out such a large area without any frame loss - by only modelling the visible top-side of buildings. To be clear, I don’t mean this as a criticism of the scenery, in fact, I congratulate the developer for managing to keep frames high in an area with tons of ultra-detailed custom buildings, something that really adds to the immersion. 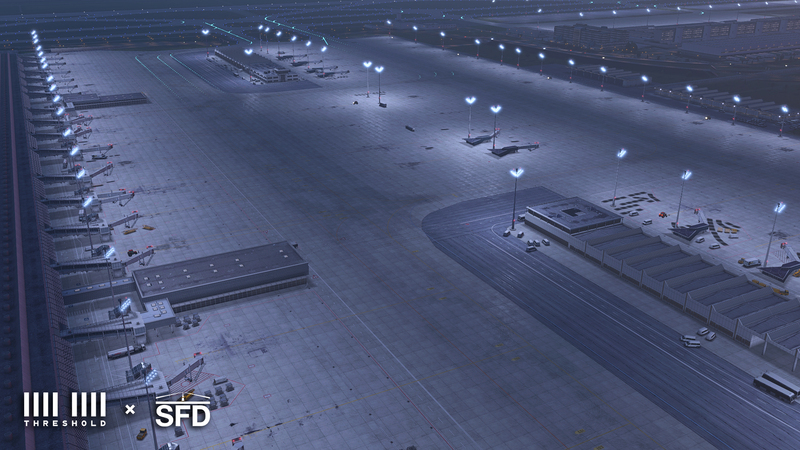 Something I can't let go of - the fantastic amount of detail paid to the terminal areas at EDDM. One thing that struck me about this scenery was the number of repeated textures. Upon further inspection of the Wikipedia page for the airport, I learnt the airport was built “all-in-one-go” (built as the replacement for the ageing Munich-Riem Airport, much like how Berlin Brandenburg will replace Tegel) and thus used many of the same materials in its construction and featured very uniform architecture styles. As such the repeated textures do actually mimic the real thing closely. Something you can’t really excuse is repeating textures on items that should not have repeating textures. For example, here, at stand 141, you can see the developer has repeated the same texture three times. Whilst this isn’t close to being a deal breaker, I think the area could have been done better. As you can see, this grease mark texture has been repeated three times. It was at this point I began delving deeper into EDDM’s finer details (nit-picking, one might say). One issue that stuck out in my mind was the phantom VDGS poles. From a distance, the poles supporting the Visual Docking Guidance System screens appear to vanish, leaving the monitor floating in the air. More disturbingly is that the distance threshold appears to be the length of the stand (tested on maximum object setting) - meaning that when eyeballing my stand, I’m left using a floating VDGS as a landmark to aid my turn into the gate. Hopefully this can be reviewed at some point. You can see, at distance, the VDGS monitors appear to "float" above ground. This appears to be an issue with the LOD distances on the object. I continued on my merry way out to have a look at some of the ground textures the new scenery has to offer. 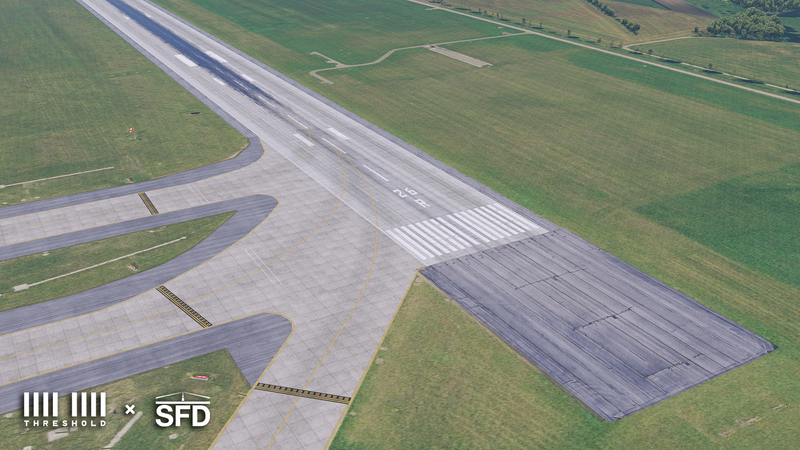 Custom runway/taxiway/apron texturing is now a standard feature of good X-Plane scenery, something the developer has really taken to heart with his latest project. Decal accuracy, although expected, is very good at Munich. I found it a challenge to fault MisterX6’s latest scenery with my trusty Google Maps tab open - I spent a good ten minutes trying to find an error with the decals, to very little success. 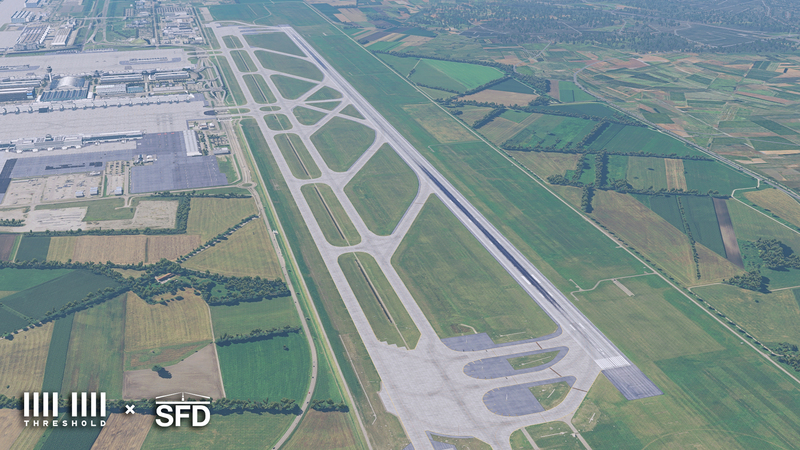 As you can see, the runway "lining" is continuous at SFD’s Munich, however, when merging with taxiways at the real EDDM, the lining ends and allows for the taxiway to merge seamlessly with the runway. 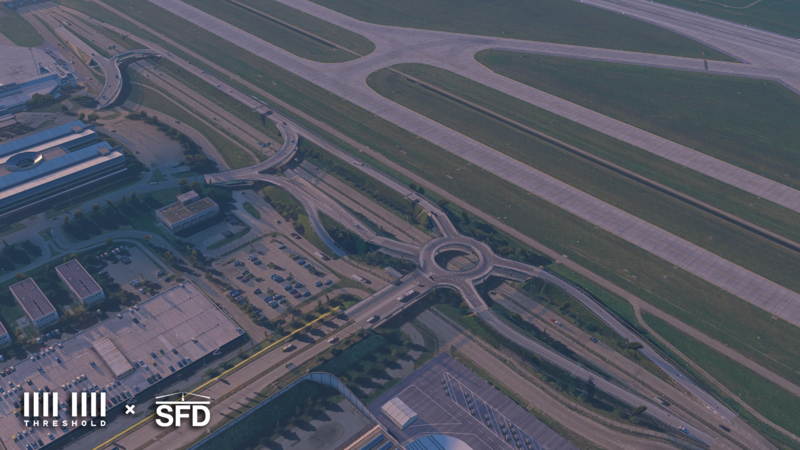 Another cool feature of ShortFinal Design’s Munich is the implementation of eight taxiway bridges spanning the ring road that runs around the field. 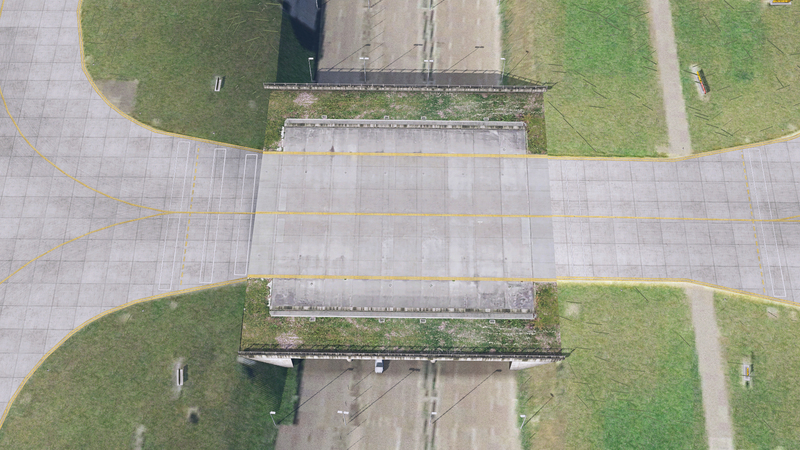 These bridges don’t merge quite as seamlessly as I’d like them to into the surrounding taxiways, however, this appears to be more a limitation of what’s possible in X-Plane rather than lack of polish from the developer. The bridge texture doesn't seamlessly merge with the surrounding ground. The issue appears to be where the custom textured groundwork meets photographic imagery on the bridge. 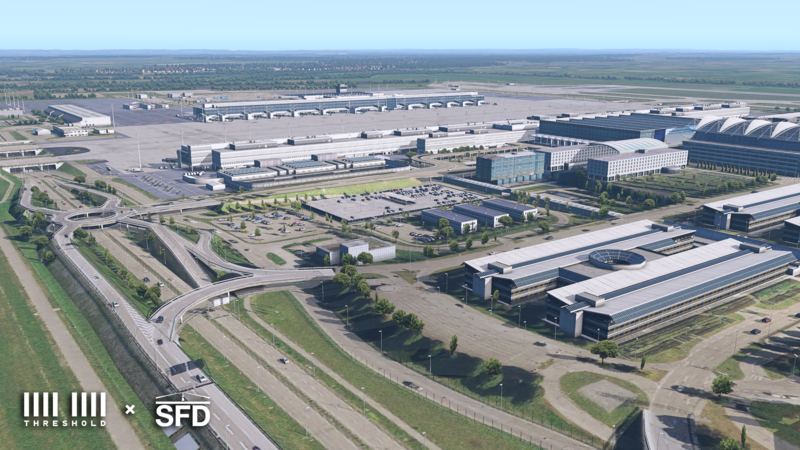 So I think I’ve established that on the whole, ShortFinal Design’s Munich is a very high-quality scenery and worthy of the MisterX6 seal of approval - but have yet to really dig into the little details, such as the many vehicles trundling around, use of vegetation etc. So without further ado, let’s delve into the small details at EDDM. I’ve always admired MisterX6’s attention to detail in his previous sceneries and Munich appears to be no different. As just a small example, you can see upwards of five different types of lights/floodlights dotted around the airport, the surrounding roads and subsequent parking lots. Vegetation is also a key detail and can make-or-break the immersion of a scenery - once again, ShortFinal Design delivers in this regard. The vegetation looks fantastic when combined with the surrounding buildings and roads. Also modelled are some surrounding fields visible from the airport, which feature paddocks flanked by hundreds of custom trees - this really adds to the immersion of departure from either of the runways. 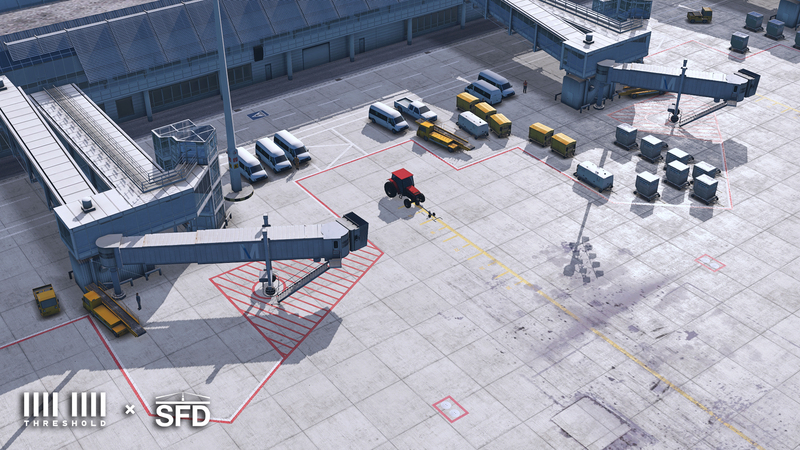 Another tiny detail I do like is the positioning of vehicles around the airport. Not all of the traffic around Munich is animated (via the Ground Traffic plugin) and those that are static add just as much realism due to their random nature. Buses are parking centimetres off centre, something that would usually annoy the perfectionist inside me, but in this case it is much appreciated as it gives the impression that some airport worker hastily abandoned it - such is the workload of ground crew. On the topic of ground crew, I also admire how the static equipment is placed around the stands. Many a scenery place baggage loaders in position and appear to be lined up with an aircraft that isn’t there. 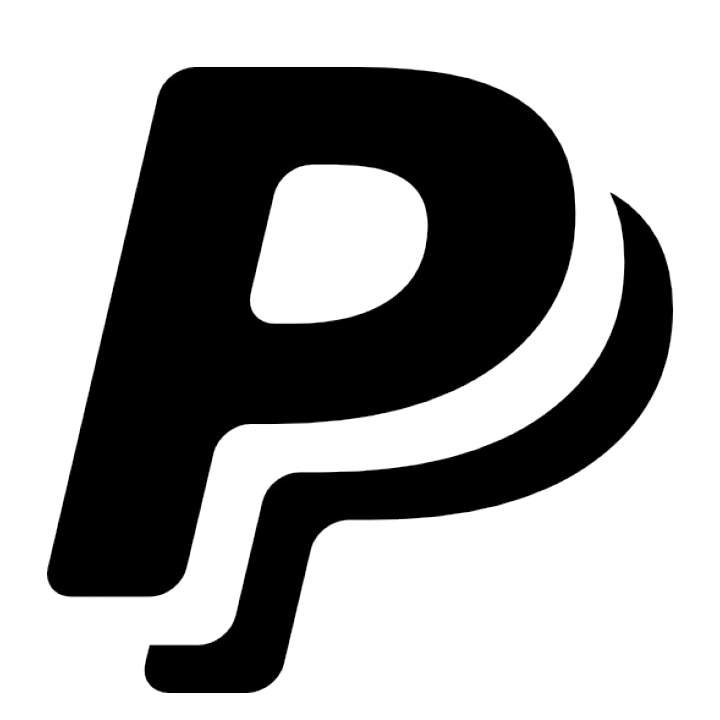 This also leads to conflicts with plugins such as Ground Handling HD or aircraft specific vehicles, where you would see double-ups of the equipment. I like how the developer places ground equipment - not perfectly, but rather in a type of controlled chaos kind of way. MisterX6 takes a different approach to this, by placing the bits and pieces necessary to turnaround an aircraft off to the side. This ensures no interference with the aforementioned ground handling plugins - something a self-proclaimed stickler for immersion appreciates. One of the final points I’ll touch on is night lighting. By sunset, the airport lights up in LED white and really brings the PBR ground textures into play. The lights reflect off the apron beautifully and while the sun still pokes above the horizon, it compliments the red-ish glow of the terminals extremely well. 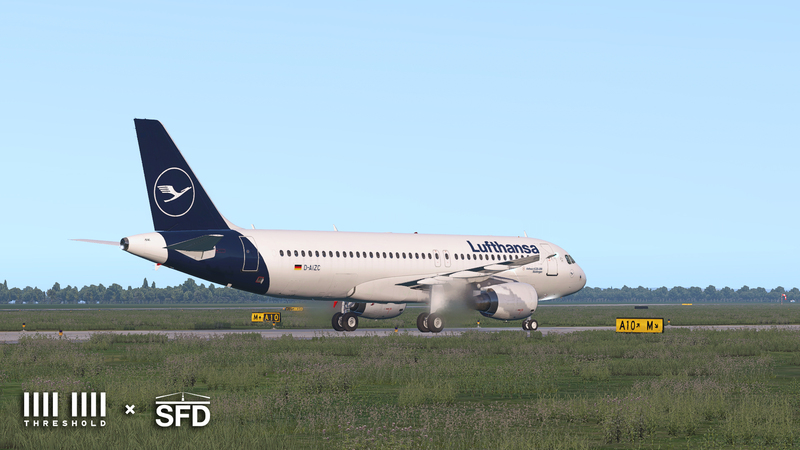 Can you tell I like the Lufthansa A320 livery? The party really starts once the sun goes down though - all the buildings light up, along with the street lamps and floodlights in the non-airside portions of the airport. One particular favourite of mine is again the roads, with the traffic trundling past the powerful apron lighting and onwards to the maze of dimly lit streets ahead. As I’ve said already, the road system really adds to the immersion at Munich and the nighttime traffic is no exception to this. I also love the lighting of the main pavilion, recognisable by its open-air design and striking roof detailing. This landmark is visible from the apron and the light reflecting off the roof looks fantastic from the cockpit. 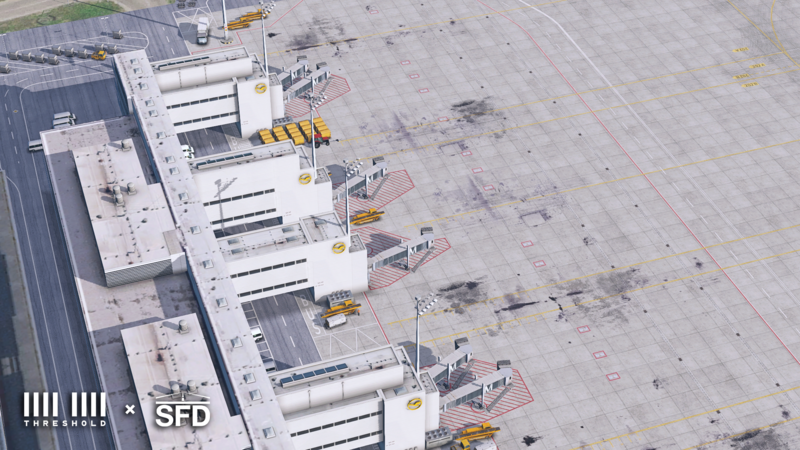 Another much talked about feature of ShortFinal Design’s Munich is the usage of the new Scenery Animation Manager plugin by Stairport Sceneries. Essentially, SAM allows the developer to place a bunch of moving parts into sceneries, such as complex multi-door jetways, openable hangars and animated ground staff. You can learn more about SAM on one of our previous articles here - or check out the support sub-forum on the Threshold Forum. ShortFinal Design was one of the notable early adopters of SAM, claiming that all of their previous sceneries will receive updates with the new animations in the near future. Munich is the first such project with SAM integration. 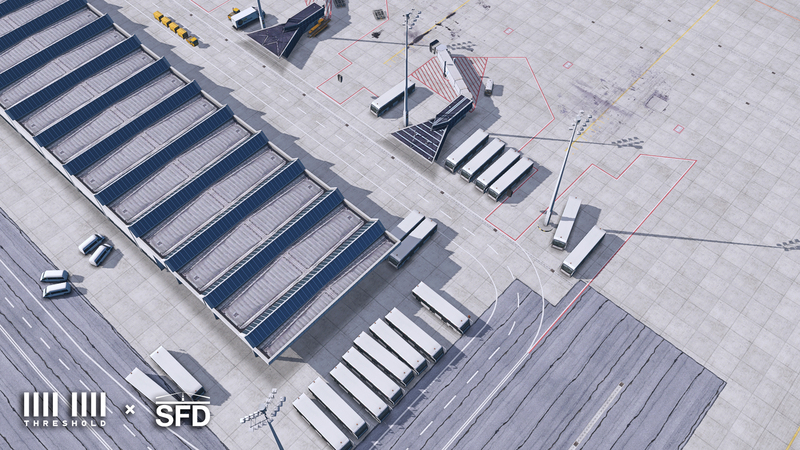 Upon opening the SAM menu, you can see that ShortFinal have placed jetways for stands 101 through 318, a number of which have multiple aerobridges for docking with large aircraft, one of the most hyped features of the new plugin. VDGS systems are installed at all gates and stands, and while not in use they display in-sim UTC time. I consider this a bit of a downgrade from the developer’s previous scenery, KLAX HD, which had monitors showing atmospheric pressure, time and temperature in-sim. This could be considered an apples-to-oranges comparison though as the monitors at LAX did not double as docking guidance screens. 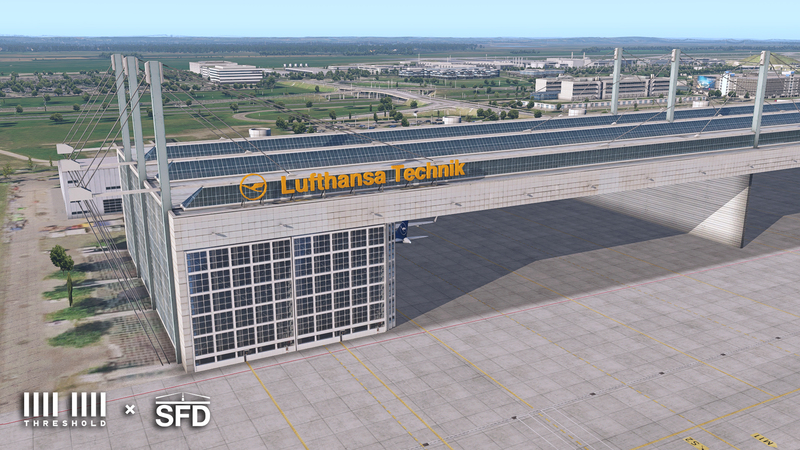 Also implemented are five hangars, two Lufthansa Technik, one CityLine Technik and two Air Berlin Technik buildings. 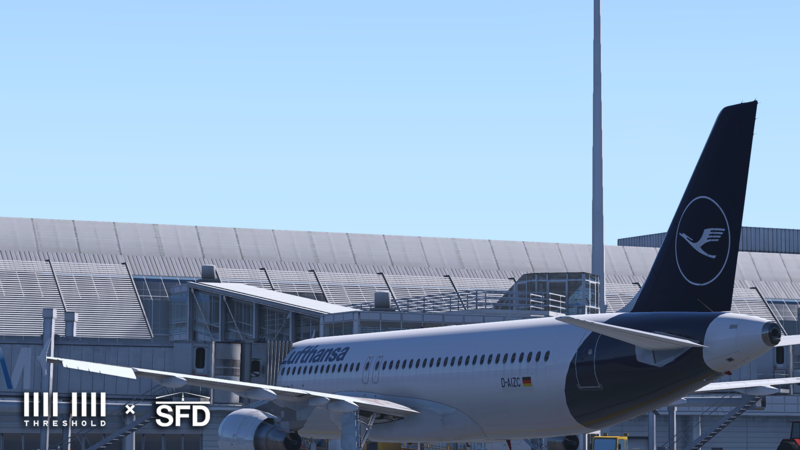 Although Munich uses SAM’s jetway animation capabilities, the developer still made custom aerobridges to fit EDDM. These are done in good detail, with a prominent “M”, for Munich Airport, on all of them. The hangars are also very cool - they’re located at the far end of the airport down by the cargo apron. Once opened via the SAM menu, they reveal a couple of static aircraft and a place to park your own should you require some maintenance. One complaint I have about the hangar and indeed many other ‘roofed-off’ areas is the lack of detailing - for example, there is no equipment located in the hangar, nor do the ground textures reflect the change from outside to indoors. I dislike how there is no equipment in the hangar, nor are there any changes in the ground texturing to reflect the indoor location. However, on the whole I do like how SAM is integrated into EDDM and hope to see it in SFD’s future sceneries. There is a rumour going around that the price for licensing SAM for a payware scenery is very steep and that developers might have to pass on the cost to a consumer, however, should future airports be integrated so closely with SAM, I would be happy to pay the extra for the modern jetway solution. So, how does a scenery of such detail perform in regards to framerate? The answer: remarkably well. To gauge just how well, I decided to run a test flight from Frankfurt to Munich. Before I go any further though, I will list the specs this test was run on. My PC has an i5 7600, GTX 1060 6gb and 16GB of DDR4 RAM. I run X-Plane on medium-high settings and normally experience a framerate of around 28 smooth. 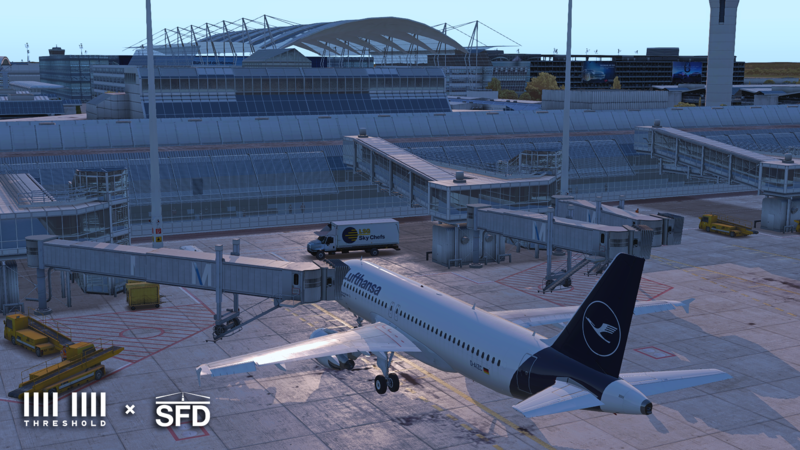 I used the Aerosoft Frankfurt scenery as a point of comparison, as the airports are relatively close in size. 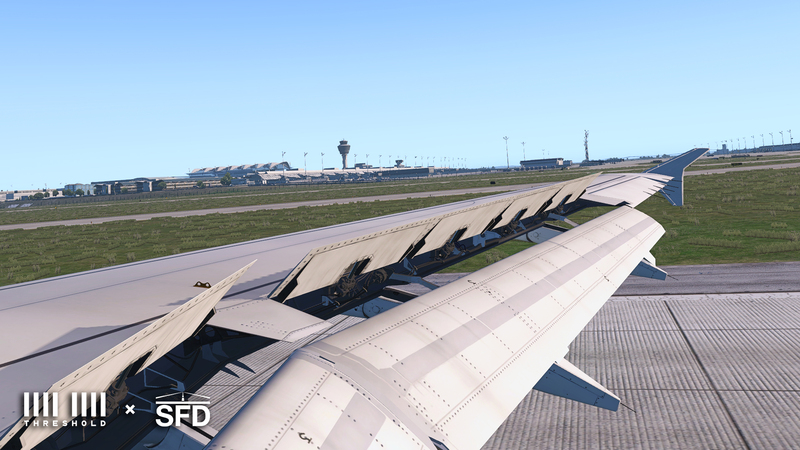 Loading up at the gate (at EDDF), I was again experiencing normal FPS, as it hovered around 28. This persisted through the deceptively short flight down to the Bavarian capital. On final approach the frames were actually a touch higher than expected, at a stable 31, until about 3 miles out, when they dipped back down to the average. Once on the ground I experienced no change in FPS and stuck around 29 all the way to the gate. 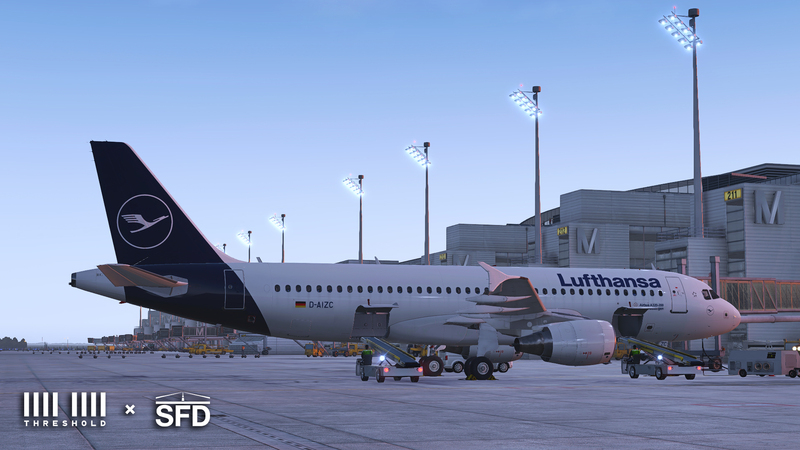 Departure from EDDF, enroute to EDDM. 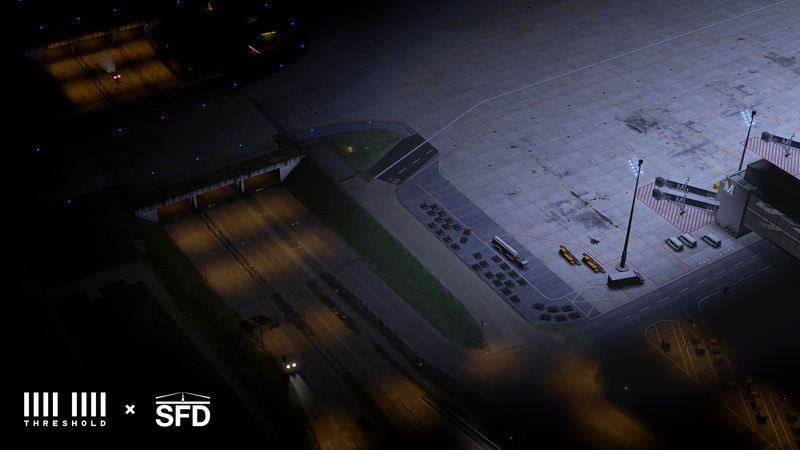 ShortFinal Design have done a fantastic job at creating an incredibly detailed scenery while still maintaining very usable framerates and actually beating out some of the comparable competition in this regard. 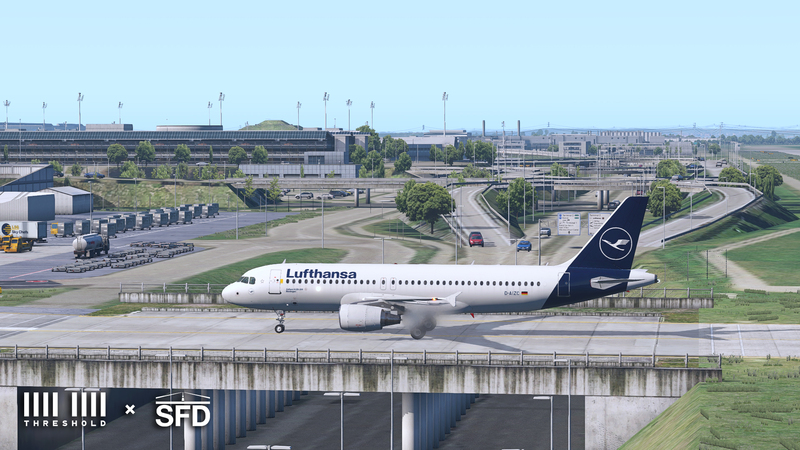 In summary, I really like ShortFinal Design’s Munich. It’s one of the most detailed sceneries I’ve ever had the privilege of using. 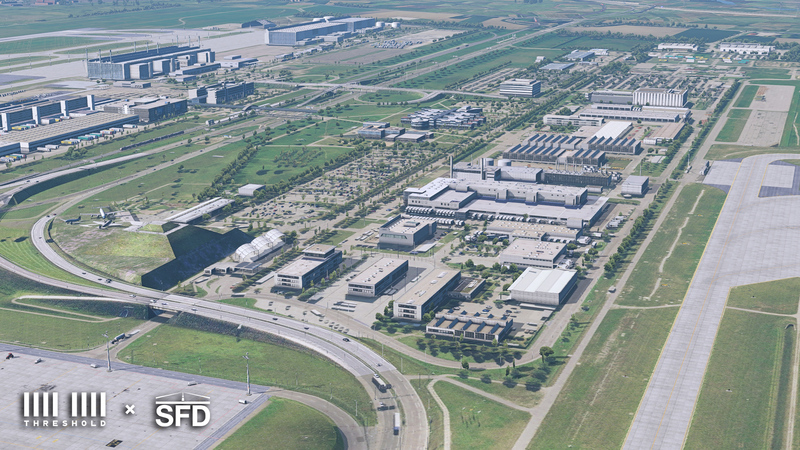 It’s also the first scenery I’ve seen that pays so much attention to the non-airside portions of the airport, using a combination of detailed facades (not quite fully detailed buildings, for performance), trees and vegetation and road models to give it a very realistic look and feel, something unlike any scenery I’ve seen in X-Plane. 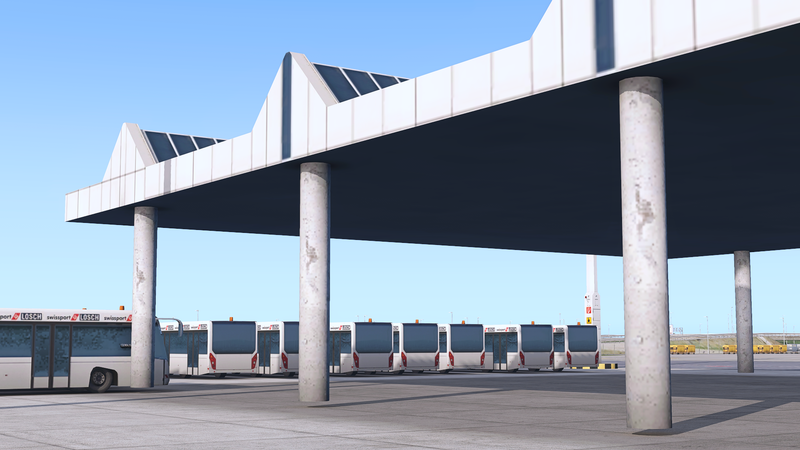 The little details also contribute to the immersive feel at Munich - buses parked ever so slightly differently, the attention payed to the roading infrastructure, meticulously crafted buildings and the detailing that goes with them, it all goes together to create a very addicting scenery. MisterX6 has kindly revealed to us the planned price point of Munich, which will sit at $26.95 USD. This is a very fair price and for that gets you a lot of scenery. I feel that it is definitely worth the money and I personally will be buying this scenery again to show my thanks for such a fantastic new airport. I highly recommend you purchase ShortFinal Design’s Munich (EDDM) when it releases. It is a very high-quality scenery at an unbeatable price - it’s also suitable for all, with short hops to continent spanning long hauls giving you plenty of choice to utilise this scenery to its full potential. 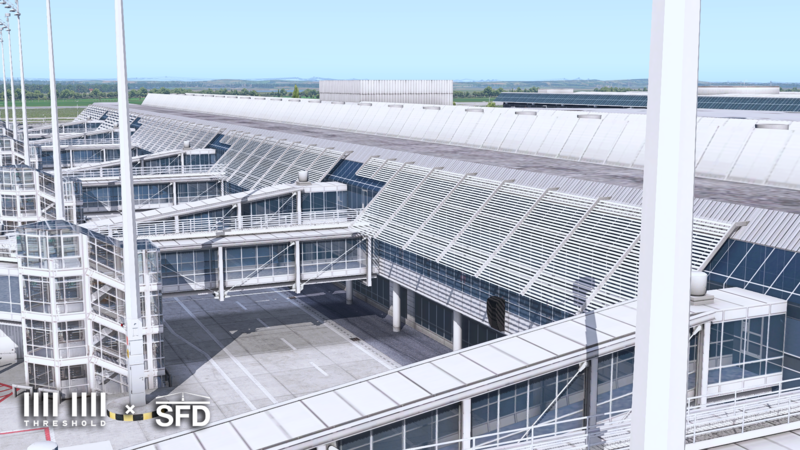 ShortFinal Design's Munich Airport (EDDM) is available for $26.95 on the X-Plane.org store.